We had a nice turnout for the last Barrel Racing and Pole Bending open arena, warmup and Jackpot. Everyone really enjoyed the 2 entries for 1 money with combined times average for the winner. 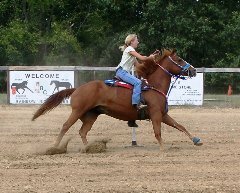 With 2D poles and 3D barrels, it was possible for everyone to compete whether novice or more seasoned horses and riders. Another event is planned for Sat, Feb 23. Our horse or yours! Horse Boarding, Riding Lessons, Trail Rides, Ranch Sorting & Roping, Horse Shows, Birthday Parties, Boy scouts, Girl scouts, Facebook us!